Wow they're a lot more expensive than I was expecting. I like Orgrim and Gul'dan the best. Durotan is okay-ish and Lothar looks terrible. Are these pay up front or when ship? Wouldn't mind preordering with the option to cancel if the movie is terrible. Gul'dan looks close enough to in game that I would probably keep it anyway. I really want Gul'dan, but that price is hilarious. Even for 1/4th it would be too much, but at least understandable. You can get 1/4 Kerrigan for one hundred less or a Gul'dan nowhere near her size. Blizzard is obsessed with the orcs these days. They've been pushing them more and more since W3. Does anyone know if you preorder through Gentle Giant's website if they charge you for the full amount upfront? Gentle Giant does great work, but man the release dates are like 3 decades after prototype reveals...it is really deflating. 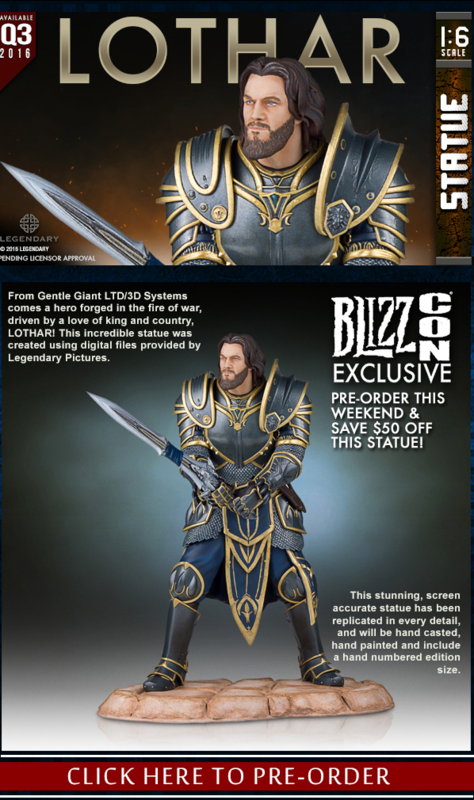 So we should see these statues when Warcraft 3 the movie comes out. Well, there goes my interest. Weta has the 1:10 license and their art direction looks more promising.